Thanksgiving is tomorrow, and the rest of the holidays are right around the corner. It is definitely the season for food! One of the staples and icons of any holiday feast is Turkey. Turkey is a savory and delicious bird but there are different ways to cook it. Some are safe, some not so much. One of the more popular methods of cooking Turkey is by deep frying it. Deep frying a turkey cooks if quickly and maintains a lot of the juices that otherwise seep out. However this deep fryer is large and must be used outside in an appropriate place, not on your deck! Deep frying a turkey can be dangerous when done improperly. There are various steps that must be taken before even putting the turkey inside the deep fryer. A very important one is to make sure the turkey is not frozen. A frozen turkey leads to explosive bubbling of oil coming out of the pot and spilling everywhere. If this is done on your deck the over 300 degrees Fahrenheit oil will spill on the boards and potentially cause a fire. 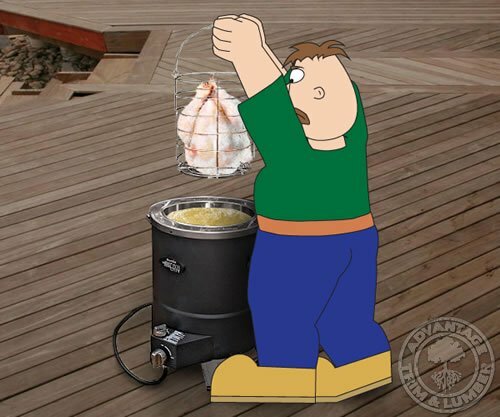 If you are going to deep fry a turkey, take the proper precaution and follow the correct guidelines! This entry was posted in News and tagged deep fry turkey, turkey deep fried on November 24, 2015 by Mr. Ipe Hardwood.